September 11, 2012 (Jackson) - Belhaven University has utilized new advances in design to create a center that promotes learning and critical thinking among its students. As one of only two in the state, the Belhaven University Think Center is an active learning space that encourages collaborative thinking, where all students can meet, study, generate ideas and get academic support. The purpose is to provide a flexible and adaptable learning space that encourages and engages students in their academic endeavors. Many universities across the United States are reconsidering how space, technology and teaching can be better integrated for a greater impact on college education. Because learning environments and facilities play a major role in education, Belhaven was looking for a way to help students connect, get inspired and achieve deeper learning. There will be an open house this Thursday, September 13 for students from 10:00 A.M. to 6:00 P.M. The first 100 students will get a t-shirt! Students can enter to win an Itunes gift card. Faculty and staff are invited to come by this Wednesday, September 12 between 2:00 P.M. to 5:00 P.M. for their open house. Current research states that people are more engaged in their learning and thinking process when they have furnishings, resources and surroundings that support it. Most of the furniture in the space is moveable. Everything from the color and fabric to the furniture and equipment was researched and is meant to contribute to learning. The work areas and collaborative technologies will support students interacting with each other. 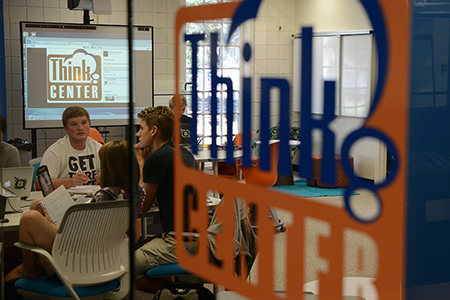 The Think Center has high-tech equipment like several MacBooks, a media hub and smart board, but Price also believes the low-tech equipment like paper tables and whiteboards will be a valuable resource. Students will be able to see and map out their thoughts whether on a piece of paper or a smart board. According to Price, the space has the potential to be more than a space for students to collaborate; peer assistance, seminars, events and collaborations with faculty are in the Think Centers future.